It is one of the most famous orchestral pieces in the Western cannon. Since its debut in 1742, its popularity has never waned; making it one of the most continuously performed pieces in history. The composer's work comprises over a third of the Brandenburg's repertoire and yet they have never performed this piece; until now. The piece is Handel's Messiah. And all of its notoriety creates a fundamental danger for anyone who seeks to perform it: Everyone knows it. When taking your seats, one expects to be celebrate For Unto Us a Child is Born, to reflect on how He was Despised, and of course, be brought to our feet by the Hallelujah chorus. 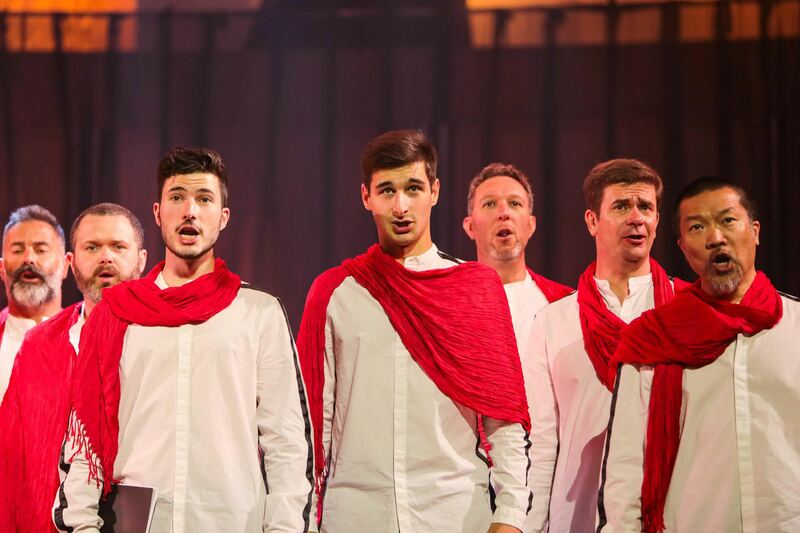 When we see Messiah live, we expect it to be delivered with perfect technical skill and also to feel refreshed and uplifted through its retelling, or rather, its replaying. The Brandenburg Orchestra's raison d'être is to faithfully cultivate and perform Chamber Orchestra pieces of the Baroque period. So how does one faithfully perform Messiah, but in a way that "you've never before experienced?" The answer lies in music historian Alan Maddox's pre-performance talk. Without it, you may be left wondering about Dyer's choice of delivery – especially so because Messiah opens without introduction or explanation. In fact, your reviewers strongly suggest you attend Mr. Maddox's talk to re-position your expectations for this performance and better understand the daunting task that Paul and troupe have taken on. While Maddox always plays some examples to whet your appetite, most importantly, he explains the stylistic origins of this piece. By writing Messiah in the style of an oratorio, Handle was attempting to bring an operatic style of storytelling to the English crowds of the day. With this background in mind, the unique staging of the Brandenburg's rendition of Messiah settles into place. The Brandenburg is performing the Messiah as a dramatic story, in keeping with its oratorio style. This isn't to say that the Brandenburg's performance is like an opera – but neither is it performed as a stuffy piece of choral music where the choir is merely another instrument in the orchestra. And in Constantine Costi, our Artistic Director Paul Dyer has found a fresh and mesmerising way to present this classic Oratorio. 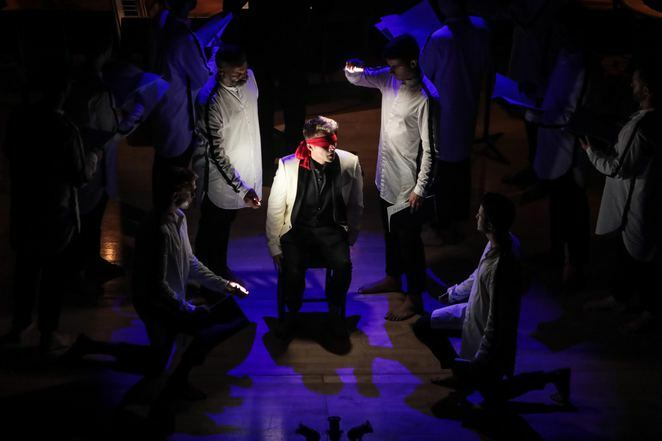 In fact, like the great Handel altering his score based upon the talent on offer, it's fair to say that the availability of Constantine Costi's staging and Dyer's willingness to embrace Costi's vision might be what finally compelled Dyer to treat us to Messiah. To this end, Costi has staged the chorus in a way to elevate the choir from an afterthought to equal billing with the orchestra. The staging succeeds in achieving this goal in accordance with the Brandenburg's desire to offer the audience an experience that is heightened by being in the room as opposed to just listening in. Yet, as regular readers of our reviews will expect, we authors had two very different takes on the result of this non-traditional presentation. One of us absolutely adored it. The staging of the choir was refreshing, compelling, and provided a new vehicle through which to experience this traditional piece. The orchestra was on point, and the soloists, particularly bass David Greco and tenor Kyle Bielfield, captivating. My only criticism is that such staging brings an added complication to showcasing the soloist's voices. This issue was particularly pronounced with countertenor Nicholas Spanos whose haunting voice was intriguing, yet often lost in the orchestra. The other reviewer, however, would describe the performance as "complicated" to observe. 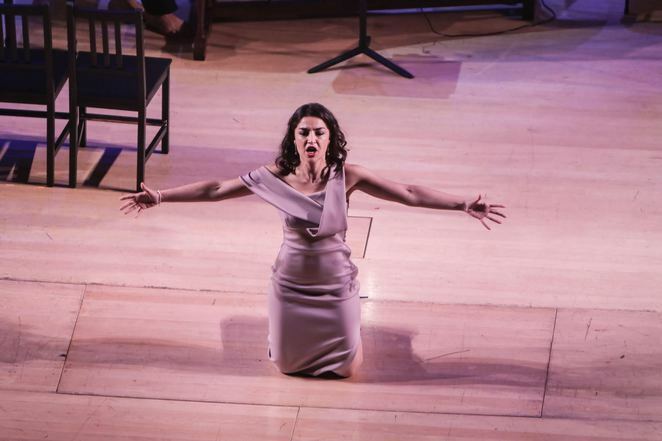 To this reviewer, the staging detracted from the performance of this time-honoured piece. Without Mr. Maddox's expert explanation of how the performance was about to be delivered, an audience member who bought tickets hoping for the nostalgia brought on by a traditional performance of Messiah might find the new presentation to be jarring. Even with the backstory, this reviewer just wasn't sure they liked it. However, we both encourage you to go to the Australian Brandenburg Orchestra's performance of Messiah. Prepare yourself for something new and if at times it is overwhelming, just close your eyes. The Sydney City Recital Hall perfectly showcases the sound of the Brandenburg's period instruments, Handle never disappoints, and Messiah is always uplifting because, well, everyone knows it.